It got me thinking. Valentine’s Day is nice for those who have a special someone. Even friends who will be your Valentine and keep you feeling included. But, if you’re not feelin’ it, Valentine’s Day can rub in your face what you’re missing. My kids didn’t have school yesterday due to a snow day. However, the weather had turned sunny and warm, and they wanted me to take them to Starbucks for a treat. I started wondering how I could brighten the day of those who feel lonely on Valentine’s Day. And I kept thinking about hugs. Human touch. So many people are talking these days about how it’s important, yet has become a neglected thing in our busy western culture. And I tell my kids that hugs are magic. Because they are. 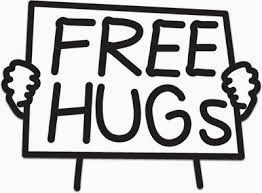 I’d seen videos on YouTube about “Free Hugs” – essentially, a guy is holding a sign that says “Free Hugs” and walking around a city. People come up and hug him, and smile. You know what I next thought, right? Yeah, I thought it. And then I couldn’t stop thinking it. I wanted to hold a Free Hugs sign. And stand outside Starbucks in the sunshine, hugging people. I realized I’d have to ask my kids what they thought of it. Because, first of all I don’t want them to think their mother is a weirdo and be embarrassed. They need to buy in. Then I thought about them holding the sign, and I wasn’t so comfy with that. Random adults hugging my kids…feels a little wrong. Kids hugging my kids…ok. Old people hugging my kids…ok. (Why the double standard? I guess because it just seems that old people need lots of love and the grandparent thing seems different. Social mores are weird. I know.) Me hugging anyone…ok. As long as no one is copping a feel. Then it’s not ok. This series of thoughts gave me some serious pause. What could my kids do that would make me feel ok? Hand out little hand-decorated hearts. Yeah. That felt ok. It was time to ask them. I called them all to the dining room table for a meeting. I was actually nervous and couldn’t say it for a few minutes, which made them impatient. Then I took a deep breath and told them about my idea, and showed them the “Free Hugs” video on YouTube. At first, they said it was weird. “Can’t we just go to Starbucks and have our drink, and that’s it, Mom?” But then Eli said he thought it might be nice. And Sari agreed. I asked Arin if she would decorate some hearts. She said she would. And Rayna asked if she could film it. So she was in. We made a poster. Now it’s really happening! What will people think, how will they respond if we do this? I guess we’ll find out, won’t we? said my inner master of worry. Yep. We got our materials together and we went. First, I bought the kids the drinks and food they wanted. It was gorgeous outside so we got settled at a table out in front of the Starbucks. I didn’t get myself anything to eat or drink, just watched them enjoy their snack. Then I started holding up the sign. But then someone came over and hugged me. Arin gave her a heart. She said thank you. Then others did. And pretty soon, we all felt really happy and awesome. Eli wanted to hold the sign. When we saw four little girls about his age (10 or so), he held it. They consulted each other and giggled. I think one of them wanted to hug him. He turned really red. Then Sari said, “That’s my Brother!” in this sort of threatening way, and they opted to hug me instead on their way into Starbucks. Eli was disappointed about that for about the next six hours. When we got home, Eli edited the video footage we had and made it into this really great montage memento of our day. The kids all said how great it was and asked when we could do it again. I’m glad my kids are open minded. We all were feeling the love. That night, we went to dinner and tried to get into that restaurant the ladies had mentioned. It was packed. They had open tables but were not seating, in order to try to let the overwhelmed kitchen get caught up with orders. I guess this is typical for a new restaurant learning the ropes on the fly. So they wouldn’t seat us. As we walked out, we saw the women I had hugged. Turns out they were co-owners of the place and they greeted me. I told them what happened, they immediately insisted on finding us a table. We had a nice dinner (though yeah, a long wait for the food). See what hugging can get you? My kids did. And I guess that’s a nice lesson on Karma.